In December we move back to San Francisco. It’s been a great adventure, though for much of the time it’s felt like one long business trip. Over the last few weeks something has changed. Budapest suddenly feels like a second home. Maybe it’s the seasonal change. As summer days shorten into fall, beer gardens have transformed into parking lots and the gelato trolleys have vanished. It feels like goodbye. But nights remain warm and people stroll. We don’t stroll in San Francisco. Our life is slower here. Being nine hours ahead is far more accommodating than being nine hours behind. Especially for an insomiac. Mornings linger. We wake to the light. Over coffee, I check email; Nick, Facebook. We play Smooth Morning on Spotify. The city rumbles outside our window. After morning meetings with Korea and Australia I gear up for my 5-minute commute. Our days and nights are just as predicable. The biggest variable is whether or not to go to the gym. I always protest but inevitably give in. For dinner we have our go-to recipes (different from our San Francisco ones) and favorite restaurants. We order lemonade more often than wine, foie gras more often than we should, and goose leg on a regular basis. It shows. We’ll need to course correct upon our return. On weekends we stroll down our street to parliament building—a breathtaking sight, day or night. We rarely take the short cut. We cross Kossuth Square and over to Culinaris, the fancy grocery store for expats. I tease Nick about the Bi-Rite prices but never suggest an alternative. This was our last unscheduled weekend. Yesterday we walked over to Margit Island. We joined the crowed at the zenélő szökőkút (music fountain) and watched the dancing water for a few songs before napping in on one the island’s many open fields. 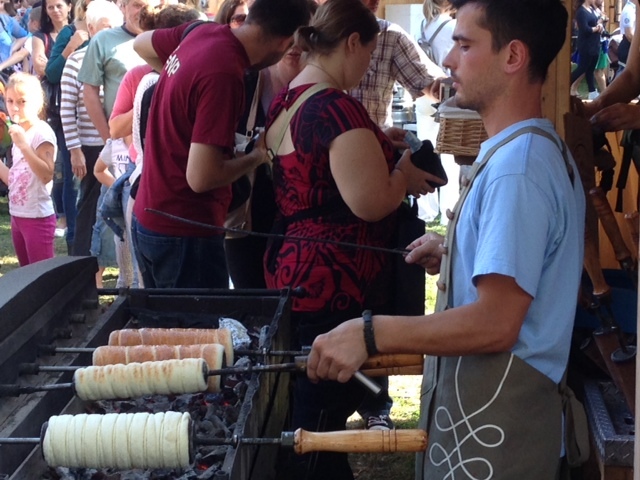 Today was the kürtőskalács fesztivál (chimney cake festival) in City Park. More course correction needed. Our last two months are scheduled to the hilt. I have a few business trips and Nick has his research to compile and school applications to complete. Additionally, we’re planning farewell activities with friends, old and new. In our prolonged goodbye, we are squeezing Budapest tight and already feeling that longing evoked from a distance we’ve yet to cross.